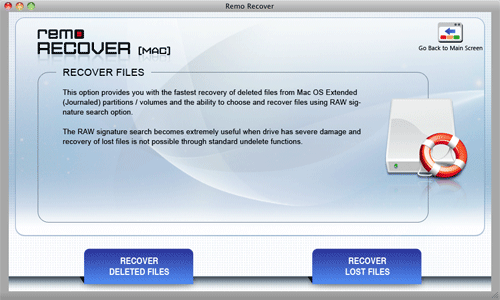 Mac File Recovery software can restore accidentally deleted files from Mac hard drives in easy and effective way. Generally, the files that are deleted from hard drive using Command+Delete keys are not permanently deleted. The pointers pointing to the location of those files are removed in allocation table that makes those files inaccessible. The information still exist on the hard drive until they are overwritten by other data and such info can be easily retrieved using Mac file recovery tool, which is very helpful in the recovery of data from MacBook Air after Apple Partition Map corruption. 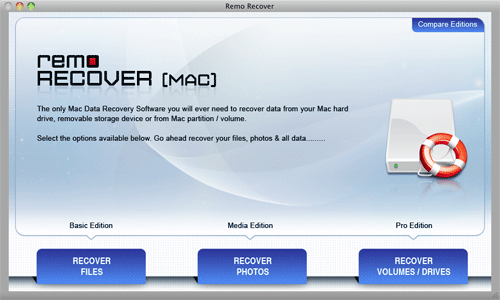 Step 1: Download and Install the demo version of Recover Deleted Files Mac application. Run the software, Main screen will be displayed with 3 different options like "Recover Files", "Recover Photos" and "Recover Volumes / Drives" as illustrated in Figure 1. Step 2: On the next screen of the application. select "Recover Deleted Files" option as illustrated in figure 2.